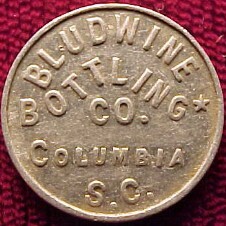 South Carolina has had a long and varied history, much of which is reflected in the various tokens that have been issued within the state. Although a small state, and thereby not having a great many tokens, much can be learned about South Carolina by studying those pieces that do exist. 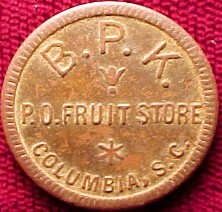 The first token that can arguably be called a South Carolina token was struck even before there was a South Carolina. The Carolina Elephant Token, long catalogued in Richard Yeoman's A Guidebook of United States Coins, is believed to have been struck in London during the late 1600s. At that time, Carolina was a royal colony (comprised of land that was later partitioned into North Carolina and South Carolina) under the proprietorship os several of England's prominent citizens. 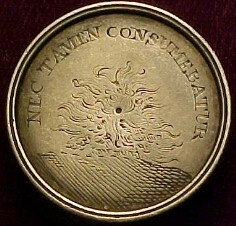 It is thought that the Elephant tokens were struck as a type of advertising piece to promote interest in the new colony. Some specimens in existence today show wear (which suggests the possibility of circulation as a medium of exchange), but there is no concrete evidence that they circulated in the New World. 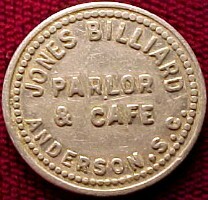 Most numismatic schlars believe that if any of these tokens did circulate, they did so in England and not in Carolina. 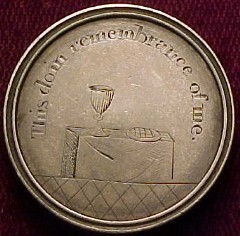 In the year 1800, the Presbyterian Church of Charleston issued a group of communion tokens [ Obverse - Reverse ] to its parishoners. The tokens were made of silver and the church members had to present them before being allowed to receive communion. 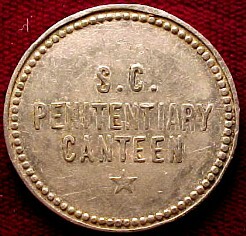 It is believed that Union troops confiscated a group of these tokens from the church and its members at the end of the Civil War. Although not a trade or merchant token per se, this early token is sought after because of its distinctive history. 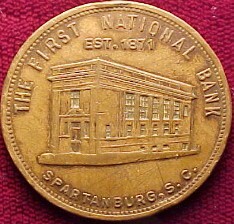 Chronologically, the next South Carolina token that the collector would encounter is the R.L. 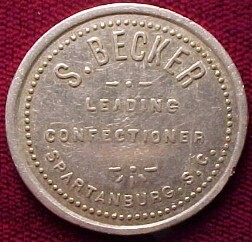 Baker soda water token from Charleston. It was exchangeable for a drink of soda water and bears the date 1837, and therefore qualifies for inclusion in the Hard Times Token series. As the only issue from South Carolina in that series, it is highly desirable. 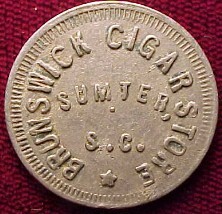 It can rightfully be called the "Granddaddy" of South Carolina Trade Tokens. 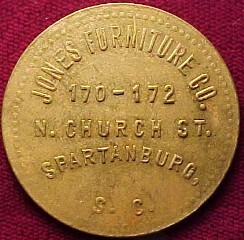 There are a few other South Carolina tokens that fall into the pre-Civil War time period. All of these were issued by merchants in the Charleston area, and they functioned primarily as a means of advertising. 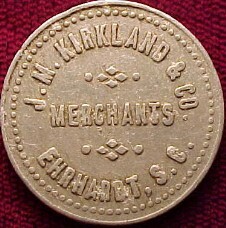 Known today as merchant tokens or "storecards," they have been cataloged by Miller in A Catalogue of U.S. Storecards or Merchants Tokens and more recently by Rulau in U.S. 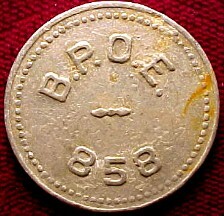 Merchant Tokens, 1845-1860. 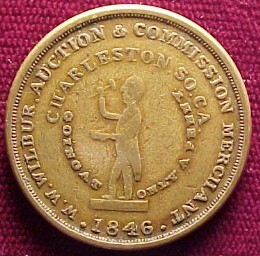 W.W. Wilbur, an auction and commission merchant during the 1840s and 1850s issued many tokens [ Obverse - Reverse ] that advertised his business. It is popularly believed that Wilbur auctioned slaves. 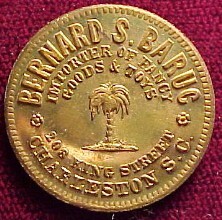 Bernard S. Baruc issued tokens [ Obverse - Reverse ] that advertised his store at 208 King Street. 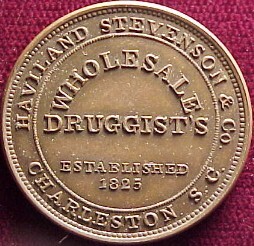 And druggists Haviland, Stevenson & Co. advertised their drug store with tokens [ Obverse - Reverse ] bearing an eagle perched on a mortar and pestle. 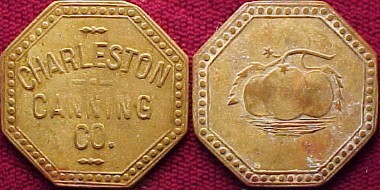 The issuance of these "storecard" tokens by Charleston merchants indicates the commercial prominence that the "Holy City" enjoyed prior to the Civil War. 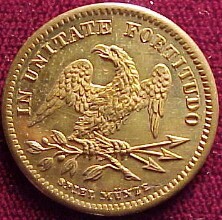 The War Between the States brought much change to South Carolina, including a great change in the circulating coinage. Gold and silver coins were immediately hoarded, and even the smaller copper coins became scarce. 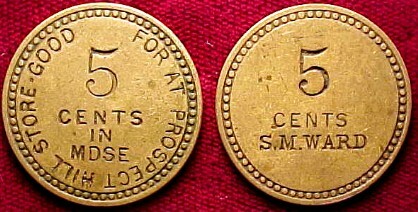 This shortage was alleviated in part in the northern states by the use of Civil War tokens, small cent-sized copper tokens issued by various merchants. 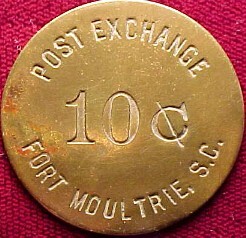 There are no Civil War tokens presently known from South Carolina. Instead, Confederate currency and other paper scrip seemed to fill the void created by the coin shortage. 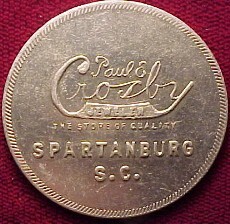 There does exist one token that may someday be shown to have been issued by a South Carolina business during the Civil War. If it could be so proven, the token [ Obverse - Reverse ] would be the only known South Carolina Civil War token. 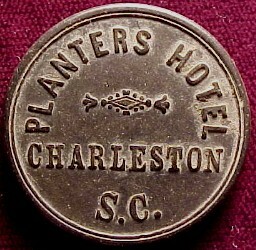 It was issued by the Planter's Hotel and is made of black hard rubber. 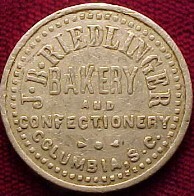 Hard rubber was a popular material for token manufacturing during the 1860s and 1870s. The Planter's Hotel was in business as early as 1809. It came under new ownership in 1860, and was known to have operated during the war. 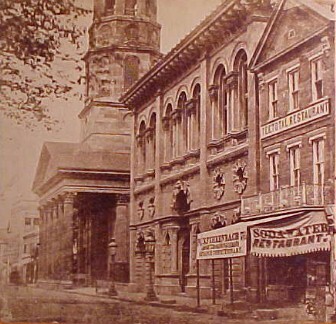 The building which housed the hotel is the same building that now houses the Dock Street Theater. 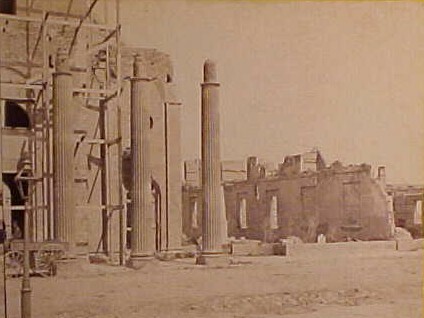 Following the Civil War, "Reconstruction" came to South Carolina. 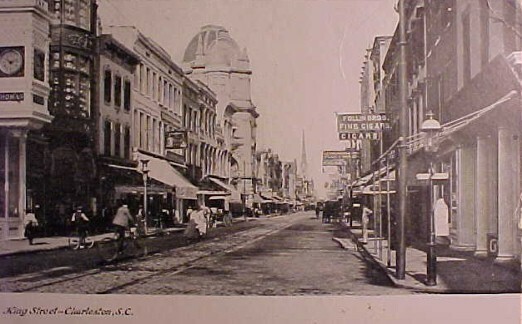 The havoc wreaked upon the state during the Civil War and its aftermath necessitated a long period of commercial recovery and this is reflected in the fact that there are very few South Carolina tokens known from the 1860s, 1870s, and 1880s. 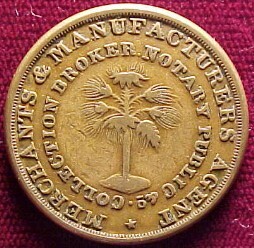 Those tokens that are known were primarily used during the 1880s and were issued by some of the plantations, merchants, and early industries along the coast. They were of the "trade token" variety; that is, they were redeemable in cash, trade, or merchandise for the value stated. By the early 1900s, prosperity had begun to return to the state. Two of the industries that were largely responsible for this commercial recovery were the textile industry and the lumber industry. The importance of both of these industries is indicated by the number of trade tokens issued by the various lumber companies and cotton mills. In fact, these two industries account for about half of the trade tokens ever issued in the state. Both of these industries utilized tokens in much the same way. 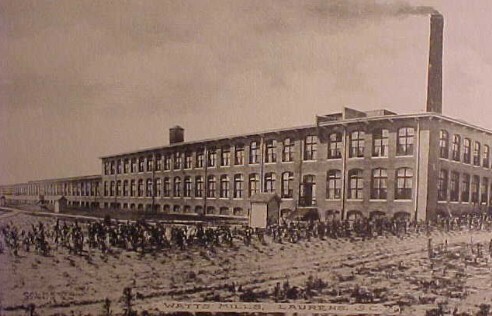 Many of the early cotton mills and lumber companies were located in isolated areas and as a result found it necessary to operate company-owned general stores for the convenience of their employees. Some of these mills then saw it to their advantage to issue their own system of token coinage. 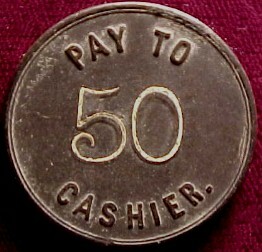 This benefitted the company primarily in two ways: by offering to pay the employees in tokens instead of cash, it led them to shop at the company store to the exclusion of other establishments; and, by using this system of private money, the mill company could avoid handling large amounts of cash except on paydays. This second point was very important if the closest bank was over 40 miles away, as was the situation in some of the more isolated mill villages and lumber camps. For all its good points, this system of private money had its drawbacks. Some cotton mills seemed to force it on their employees, not giving them the opportunity to request their pay in cash. To be sure, an employee could wait until payday to receive cash, but one who requested an advance was usually forced to accept tokens. This system tended to keep an employee in debt to the mill company. 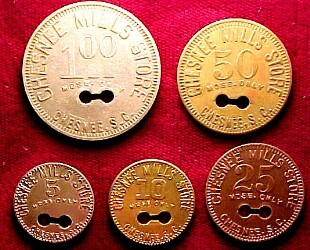 Other mills charget inflated prices for the goods in their company stores, which had the effect of making a dollar in tokens worth only 70 or 80 cents in purchasing power. Also, the system easily lent itself to abuse by enterprising individuals who ran informal black markets in the "loonies," as the tokens were often called in the mill villages. These "entrepreneurs" bought "loonies" from employees for cash at a discount (usually 70 or 80 percent of fact value) and then redeemed them for luxury items such as tobacco or cigarettes. Of course, cotton mills and lumber companies were not the only issuers of trade tokens during the early twentieth century. 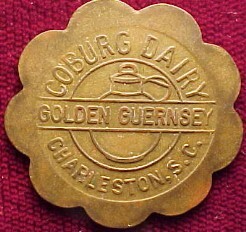 Tokens are also known to have been issued by seafood packing companies, vegetable canneries, drug stores, dairies, general stores, military bases, banks, bakeries, school cafeterias, furniture companies, prisons, shoe shops, fraternal organizations, billiard parlors, finance companies, and bottling companies. 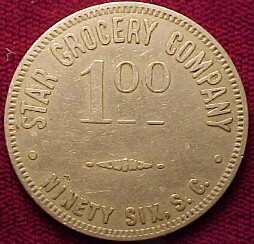 Grocers, contractors, fruit dealers, news stands, confectioners, cigar store owners, and jewelers are also known to have utilized tokens. Just about all topical interests are represented. 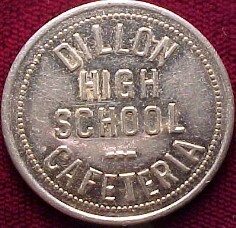 Curiously, there are no true "saloon" tokens presently known from South Carolina. 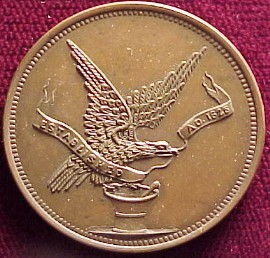 (A "saloon" token is one which has the word "saloon" as part of its inscription.) There does exist a few tokens that were undoubtedly issued by saloon-keepers, but none of them are blessed with the magic word. This situation seems to exist for several reasons. The word "saloon" evidently was not popular in the state. There were plenty of establishments that served alcoholic beverages, but names such as "The White Front Saloon" or "The Commercial Saloon" have not been encountered in searches of the business directories and gazetteers of the time. Also, saloons were outlawed in 1893 by the passage of the state Dispensary Act. This law made it illegal for any establishment to sell liquor by the drink, and the sale of alcohol by the bottle was strictly regulated by the state. This situation lasted in some form until well after Prohibition had ended. Drinking establishment such as bars and saloons were not made legal again until the 1960s. World War II seemed to bring an end to widespread token usage in this state. 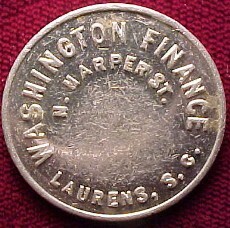 Many a token is scarce or unknown today because the bulk of its issue was donated to the scrap metal drives of the war effort. 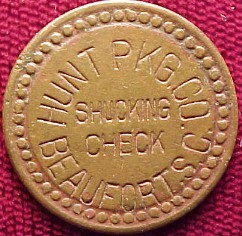 There were a couple of cotton mills (and of course, a few bus companies) that continued to use tokens after the War, but most issuers discontinued the practice in the late 1930s or the early 1940s. Copyright 1990, 1999 by Tony Chibbaro. 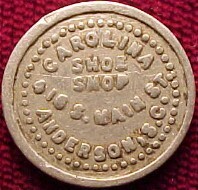 A portion of the above text was excerpted from South Carolina Tokens, by Tony Chibbaro, published by the Token and Medal Society in 1990. If you are interested in purchasing this book, please click on the following link: Books. If you collect or have a casual interest in South Carolina tokens or tokens issued by cotton mills, lumber companies, or other types of businesses, you may want to purchase my book, South Carolina Tokens and its two supplements. To read a description of these standard references, please click on this link: Books.